A good shower head ensures the quality of your bathing experience. However, using less water is also crucial to lowering your utility bills and considering the eco problems. Also, conserving water helps when you are living in areas where the supply is on the lower side. For that, you will need to have showerhead which facilitate in that area. This review will discuss the best low flow shower heads available in the market, with briefing some important features and advantages. How to Buy a “Low Flow” Showerhead? What is a Low Flow Showerhead? Buying these showerheads can be tricky as people may confuse these with “Low Pressure” counterparts of theirs. That is why keeping the following factors in mind will help you make a better judgment call. There are two types of “Low Flow” showerheads. One is the “Fixed Showerhead” and the other hand you have the “Handheld” alternative. The former requires a wall hanger and a hook to function. You can always purchase the handheld low flow showerheads but they are a bit costly than the fixed ones. It is because you get the hose and other fittings that you can use with the tool. Even though these showerheads already restrict the water flow, you’d still want to get the restrictors in place. The flow restrictors are basically shut off valves that fit in between the showerhead and the pipe. You get the on/off switch to put the things into effect. The user-friendly design and sleek finish makes Delta 75152 Adjustable Water-Amplifying® Showerhead a crowd favorite. The interesting thing about this product is that it saves up to 36% more water than the standard ones in the market. Even then you can change the water-flow settings from 1.85 to 2.5 to further customize the flow type. Don’t worry about low-speed water covering up your body. There are as many as four spray holes that pour water on your body perfectly. It will no doubt cover the whole body as the spray face diameter is 3-7/8 inches wide. To cover all the damages and troubles, the manufacturers offer a handy Excellence warranty for Delta 75152 Adjustable Water-Amplifying® showerhead. 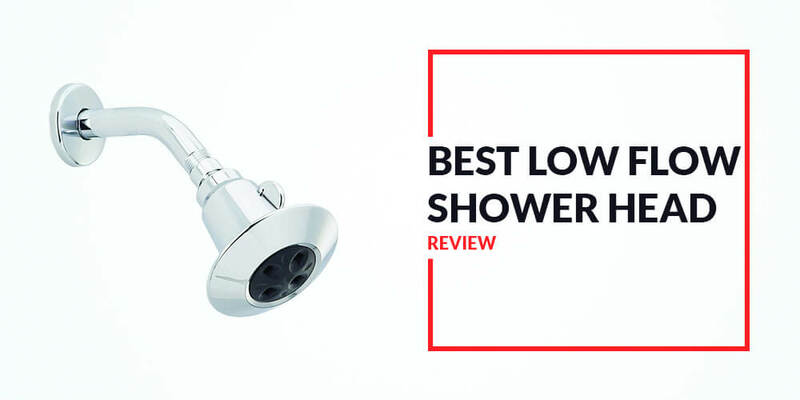 For the incredible features it, this one is our #1 spot of this best low flow shower head list! The design of this low flow showerhead makes it sturdy and it lasts the long haul. I could install this showerhead in just about 25 seconds or may be less. So far Delta Water Amplifying Showerhead hasn’t leaked after I screwed it onto the faucet. Even at the lowest setting of 1.85 GPM, this showerhead provides top notch water pressure. I noticed a drop in my water bills by 35% past year by using this showerhead. This showerhead can be noisy at times. You don’t have too many settings to experiment with during shower. The High Sierra 1.5 GPM High-Efficiency Low Flow Shower Head comes with excellent built quality and design. The solid strong metal and stylish chrome finish adds an extra dimension to your bathroom. When it comes to saving water,the advanced technology that is used in the shower head reduces water flow up to 40%. The product delivers 1.5 gallons of water per use. 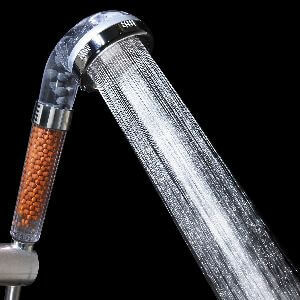 Calculating that, you will be amazed to see that a person using this showerhead saves 1700 Gallons of water per year. While delivering 1.5 gallons of water, this showerhead takes care of the body coverage as well. The patented nozzles ensure that water drops fall on your body and cover it. You can enjoy the water-flow like you are bathing beneath a stream. It is a sturdy tool to have in your shower stall thanks to the metal construction in USA. I was able to remove the flow restrictor when I wanted to. It has a WaterSense certification as proof of its capacities. The showerhead saves 40% water annually. The showerhead comes with one central nozzle in place of narrowed nozzles to concentrate more water at you. The water flow restrictor works really well. It doesn’t come with a “Turn Off” valve. Sierra itself admitted that this model produces noises. The Niagara Earth Massage 1.25GPM Low-flow Showerhead comes with high-end ABS thermoplastic body, which is fully corrosion resistant and stays usable for longer periods. The product uses 75% less water than the typical low flow water heads on the market. With using the low movement of water, it still ensures maximum satisfaction with consistent flow rate and full body coverage. The adjustable button can provide 9 settings for body massages. You can have a relaxing bath after a tiring day of work. Cleaning this low-flow showerhead are very easy. The non-aerated spray has a self-cleaning technology to ease your cleaning hassles. It comes with a gorgeous design with the attractive chrome finishes. It is made of ABS plastic that resists impacts and fights corrosion as well. You have as many as 9 jets to enjoy variety of spray settings that are adjustable too. The water flow is very much consistent despite the water pressure being low. The nozzles provide self-aerated sprays that help in cleaning the showerhead too. The water flow rate is 1.25GPM that saves you energy and annual water bills at the same time. Aerated sprays might not be a thing for some users. This Niagara Earth Massage Handheld - 1.5gpm low-flow showerhead uses 40% less water than other products on the market. To make things easy for you, installing this product takes a jiffy. You can easily mount the 72 inches tangle-free hose with your own hand. The 9-jet adjustable turbo massage system can be tuned easily by rotating the valve. Niagra combines low water-flow with high spraying rate seamlessly. You won’t notice the difference. The showerhead conserves the flow of water to save you big bucks at the end of the year. The advanced technology that uses less water flow also guarantees that you can enjoy the shower with consistent flow rate. The water stream will relax your body and mind and clean your dirt with covering decent coverage. This handheld showerhead can cut down water usage by 40% on annual basis. 72-inch hose never tangled for me and it gives me superior reach. The 9-jet system allows you to have fully customizable bathing experience. Like the previous one, this Niagara product is corrosion resistant and can absorb impacts thanks to the ABS plastic construction. I’d say this one is reasonably priced compared to other products available for purchase. ABS plastic isn’t something everyone will like to be honest. The ZenFresh Filtration Shower Head takes extra care of your skin and hair with purifying the water from chlorine and other harmful chemicals. It also increases mineral nutrient absorption and gives you healthier water supply. The shower filter works with three layers of water mineralizer to ensure purest water with reducing oil secretion. You will have smoother skin and hair with using this low-flow showerhead for few months. You can easily install, use and clean this showerhead. The Eco-friendly showerhead uses a low flow of water without reducing the quality of your bath. The “laser perforated technology” ensures that you enjoy your bath with full body coverage and different streams. You can enjoy a luxurious spa, with the showerhead without paying any money. This is truly an eco-friendly option for a showerhead that I like. I was able to install this showerhead inside five minutes by connecting a few joints. This showerhead uses minerals to filter water unlike few that use chemicals. The natural minerals nourish your scalp and skin to revitalize them. The construction of this showerhead allows you to wash the shampoo faster than you think. One bad thing is, it doesn’t come with mechanisms to adjust the water. The 1660.613.002 Flowise is a 3 Function showerhead. It has a maximum flow rate of 2 GPM (Gallons per Minute). However, when using different spray settings, the flow rate changes. For instance, when using Turbine Spray setting the max flow rate is 1.5 GPM, when using Full Spray setting the rate is 2.0 GPM and finally when using Combination Spray setting the flow rate is 2.0 GPM. It also has an Auto Return feature, which brings the flow rate down to 1.5 GPM. You can adjust the angle as you find convenient. This efficient American Standard shower head has a chrome color with polished chrome finish. This comes with a rather minimalistic design without any compromise with its operations. It has a wall mounted design that goes with all sorts of bathroom décors. 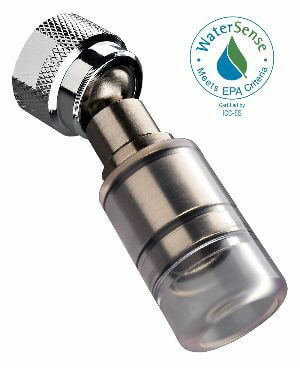 This low flow showerhead is WaterSense Certified and so be sure to save a lot of water. The Flowise Showerhead helps you to save up to 40% water to be exact. That is to say, you and your family can save up to 8000 gallons of water per year. Signature design from American Standard. The three functions work really well. You can control the water flow rate of the showerhead to different levels. Saves almost 8000 gallons of water. Every time you turn on the showerhead, you’ll have to adjust to your desired setting. American Standard Showerheads focus on efficiency in both operation and water saving. In their 1660.717.002 Flowise Shower head they have used Turbine Technology to make your shower experience more enjoyable. The Turbine set inside the shower head adds force to the already pressurized water. This not only makes the water flow energized but also saves up to 40% water per year. No wonder it is Water Sense Certified. This Flowise shower head is metal made with a chrome finish. The wall mounted design lets you set it up with almost all types bathroom fittings. The angle can be easily adjusted to suit your need. The key feature of this shower head is the 3 setting spray function. It has a maximum water flow rate of 2 GPM (Gallons per Minute). However, the flow changes with each setting. When using Turbine Spray the flow rate is max 1.5 GPM when using Full Spray, the max flow rate is 2.0 GPM and when using Combination Spray the flow is also 2.0 GPM max. If you like to return to the original setting, the Auto Return feature brings back the flow rate to 1.5 GPM. Reduces the water bill considerably. Delivers the water pressure that you are looking for. Price is decent when compared to the features. Different settings save water in different counts. Just like the previous model, you’ll have to adjust to your favorite setting every time you turn it on. 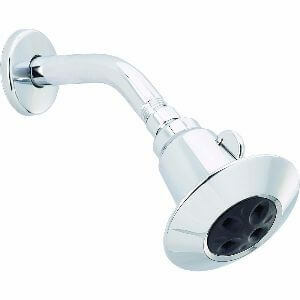 The Kohler K-14519-CP Bancroft is a single function showerhead made with solid brass. The brass body is then coated with polished chrome finish. It is a wall mounted showerhead, so it easily goes with any kind of bathroom fittings. This K-14519-CP has a maximum water flow rate of 2 GPM (Gallons per Minute). Compared to conventional 2.5 GPM showerheads, this Kohler product offers far better shower experience. Even with less flow rate, the showerhead uses 20% less water than the its competitors. The low flow showerhead utilizes Katalyst Air-Induction Technology to take your everyday shower experience to a new level. This technology infuses 2.2 liters of air through the showerhead into the pressurized water. Then what? Well, by infusing air into the water stream the water drops become larger and retain most of the heat. This makes you feel that the shower has more volume and water is perfectly warm. The nozzle geometry of the sprayface makes the water flow more focused. And the MasterCleanSprayface also counters hard water to build up and so it is easy to maintain and clean up. Force of the water is great for a decent bath. The water droplets are soft and thick on your skin. It saves you water and your bills by a great deal. The Whedon AFR6X Hand Held Shower is designed to deliver a great shower experience. The shower comes with Flexible Bungy Hose, Arm and a Wall Bracket. The handheld shower is very easy to install. The Bungy Hose is manufactured with stainless steel. And then the whole thing is Chrome plated. This gives the showerhead an elegant radiance. So, it easily goes along with your bathroom décor. The construction, as you can guess, makes the handheld shower durable and will last a long time. Even though Whedon is built with stainless steel, it is lightweight and so your shower experience is always comfortable. The handheld showerhead offers 7 different settings. All these settings focus on making your shower time as perfect as possible. Plus, Whedon offers Kit Massager that is included with the shower. But don’t worry; the massager does not require any batteries. It has a maximum water flow of 2.5 GPM (Gallons per Minute), which is optimum for a pleasant shower. It is your “Budget Friendly” low flow showerhead. It is a lightweight bathroom accessory. Comes with 7 different spray settings. This one lasts the test of time. Not particularly good looking accessory. It is a bit heavier than others on this list. If you loved the previous entry in my “Best Low Flow Showerhead List” from High Sierra, you’ll love this one too. This handheld showerhead from the same company is WaterSense certified recognizing its water saving capacities. As you know, you get strong spraying action from High Sierra with large droplets that make your shower enjoyable. Furthermore, it comes with a Nickel-made mount that grants it durability. In case you are living in an area where the water is mineral rich, this showerhead won’t get clogged by them. At this point, I don’t need to tell you that this showerhead pours water at a rate of 1.5 GPM. You have an ergonomic handle that has a non-slip grip just to ensure that people don’t fall prey to an accident The 72-inch long hose makes it super extendable for easier bathing. On top of the “Handheld” function, you can use it as a fixed showerhead too. There is a “Swivel Joint” that allows the fixed showerhead to turn and people can adjust the angle of the showerhead as they want. Ergonomic handle helps to grip the showerhead easily. Truly lavish design.Saves 36 – 40% water annually. Can also be used as a fixed showerhead. Hose is 72 inches long and flexible. Anti-clog nozzles don’t obstruct water. Some people complained about poor water stream through the showerhead. Let me first tell you what it is not. A “Low Flow” Showerhead IS NOT a low-pressure showerhead. Traditionally, a normal showerhead delivers you 2.5 GPM water. But a low flow shower head restricts the water flow to 1.5 to 2.0 GPM. So, this tool saves the annual usage of water and in turn, your bills too. But, the thing is, there is no decrease in performance. This low flow shower head models come with “Air Infusion” technology. This allows the water droplets to be bigger and give you a drenching experience without actually increasing the water consumption. Obviously, the first advantage you have while using these products is that water consumption will lessen considerably and so will your water bills. We now know that Low Flow Shower Head systems bring down water usage by 36% – 40%. What people don’t pay enough attention to is the fact that you’ll be saving your energy bills too. Less water means less heat to warm them up. Less heat means less energy consumption throughout the whole year. As we use less energy and water for warm water baths, the CO2 dispersion in the air lessens too. So, we get cleaner air to breath in. Low flow shower head means where you can control the flow of the water and yet have a great experience of bathing. Low flow doesn’t mean that you won’t be able to wash your whole body conveniently. Rather it ensures you get the best possible shower using the small circulation of the water. Sometimes the best low flow shower head can provide you with spa like treatments.